Submitted by witness on Tuesday, February 19, 2013. LOCATION DETAILS: Right off the main street going through town. It was like a boarding house with rooms to rent as I remember, it was my first time being there, east through town. Where we were was north of town. It was so long ago it is hard to remember. OBSERVED: I was with my sister and her friend, it was night time around 9:30 p.m. When we arrived at the friends house in Granite Falls we all went inside and at that time I remember I left my smokes on the dashboard of the car so I went out to get them. As I approached the car I got an eerie feeling that something was watching me so I turned around to look and there across the road from me, was a tall hairy creature looking at me. I was so scared I could not move at first. But then I ran back into the house and told them what I saw. No one would go out to look they were too scared. I know what I saw and it wasn't a bear or a person playing a joke. It was around 8 to 9 feet tall and very large. I couldn't see its face it was too dark and there was only light from a house down the road where it became forest. ALSO NOTICED: Next day I looked where I saw it but didn't see foot prints. I think it could have been stranding on the road. OTHER WITNESSES: No, the only people I told was my sister and her friend and they were in the house. OTHER STORIES: At that time I heard of some one reporting seeing a bigfoot in Everett, Wash.
TIME AND CONDITIONS: Around 9:30 P.M., the light was poor and it was a rainy day but it was not rainy at that time but it was wet out. ENVIRONMENT: Forest..... on a side road with only a few houses on it, the road dead ended at the forest. I believe the witness to be credible in his recollection of the events that occurred many years ago when he was a teenager. He no longer lives in the area of the sighting. Granite Falls has grown substantially since the witness lived there in 1971. Although it is still a small town, the downtown area has grown and has been modernized, with many new residents moving into the area each year. The Mountain Loop Highway is a highway in the state of Washington. It traverses the western section of the Cascade Range within Snohomish County. 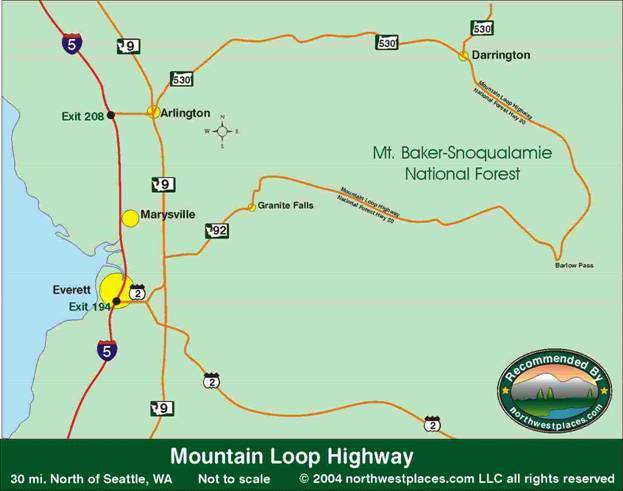 The name suggests it forms a full loop, but it is only a small portion of a loop, which is completed using State Routes 92, 9, and 530. Part of the highway is also a designated and signed Forest Highway, and is known as Forest Route 20.